Gum disease doesnt require regular treatment. But the fact is that this periodontal disease can be a serious issue for anybody if remains untreated. That is the only cause for knowing the severity of gingivitis and treatment is required. But there are some ways to avoid such afflict and that is regular brushing the teeth and flossing. Everybody should follow this simple method to keep oral hygiene. 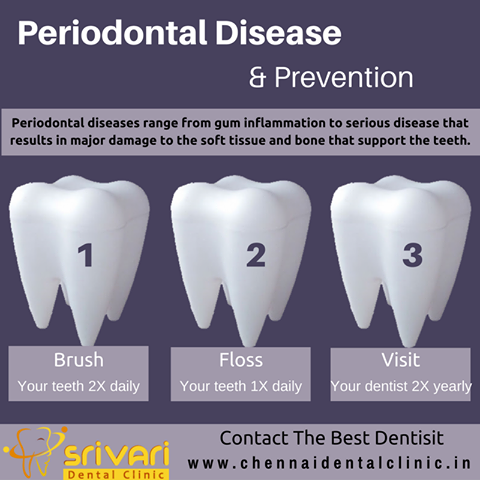 It is highly important to know the exact reason of oral treatment particularly the gum disease treatment. Anything which creates bad and uncomfortable can lead to gum disease. Amazingly, most of the time gum disease has taken for granted by a big number of people. But without treatment some below mentioned problems may happen. Dental cleaning will be achieved by visiting the dental clinic. Generally as it requires numerous equipments, dentist cant perform alone. Minimum a dental hygienist works with dentist to remove the plaque and tartar. Root Planning and Scaling is an invasive treatment which needs anesthesia. The rough spots and gum disease causing bacteria are removed by this process of thorough dental cleaning. Tissue grafting is a surgery which modifies the thin gums. Through this procedure gums can make robust by inputting some fillings. It helps the strength of gum to fight against gum disease. Flap Surgery is a surgical procedure through which gum is lifted back for removing the tartar. It helps to reduce the space between teeth and gum and obstructs bacteria to form.